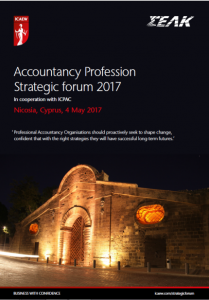 The Institute of Chartered Accountants in England and Wales (ICAEW) hosted in cooperation with ICPAC (The Institute of Certified Public Accountants of Cyprus) the 2017 Accountancy Profession Strategic Forum (APSF) in Nicosia, on the 4th of May 2017.
Business, regulators and the profession: complementary aims and perspectives. You can view the complete Forum Agenda here. APSF was initially conceived by ICAEW following discussions with professional accountancy organizations (PAOs) in Central, Eastern and Southern Europe in order to identify common challenges and a common interest in sharing experience and developing strategic thinking. The APSF encourages proactive strategic planning and innovation among professional accountancy organizations so that they continue to be relevant and contribute to market needs and the public interest. It is based on a partnership approach and holds an annual meeting organized by ICAEW with host PAOs.